juli 2010 | 774 blz. 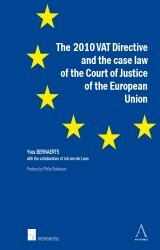 The VAT Directive (Directive 2006/112/EC) in its 2010 version is a major step towards the single market in the EU. It is a true revolution for entrepreneurs, because of the new place of supply rules and the reporting requirements established in this respect. This book provides a chronological overview of the changes in the place of supply rules (step by step).